If you want to see just how much of an impact Pinterest has made in a short amount of time, witness social shopping startup Nuji, which sent out a press release a few hours ago describing itself as ‘Pinterest with rewards’. It’s an angle that seems to be working though, with retailers queuing up to take part. 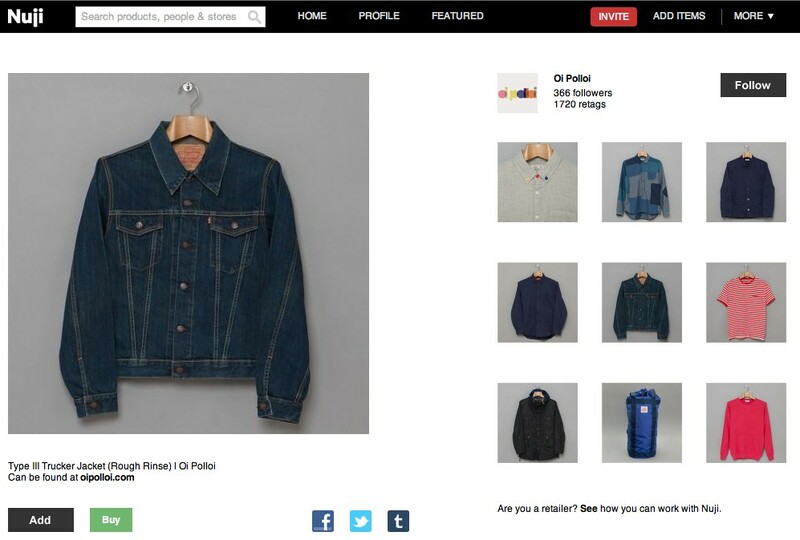 Nuji has been around for far longer than Pinterest has been popular – we first covered it in detail back in December 2010, so while it seems a shame that it’s had to frame itself in the context of another service, the description actually works quite well. Essentially, Nuji is a place where people can share images of items they want to buy, on a site and mobile app with a beautifully minimalist design. The London-based, Seedcamp-backed startup added a rewards programme in January this year. 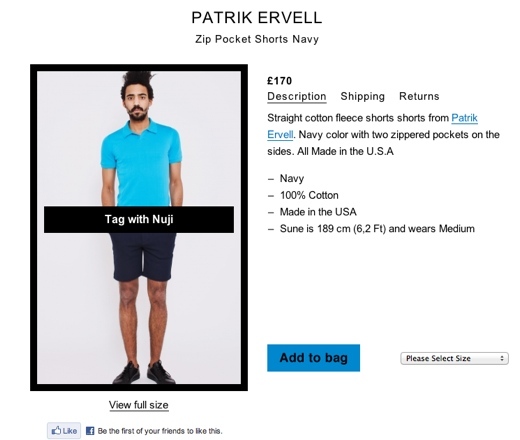 If you share (‘tag’ in Nuji parlance) an item from a store that’s part of the programme, you earn 6 points. Then, if someone else re-shares it to their account from yours, you get 10 points. At the end of the month, these points turn into discounts for any retailers you’ve earned points from, with discounts of between 5 and 20% available. 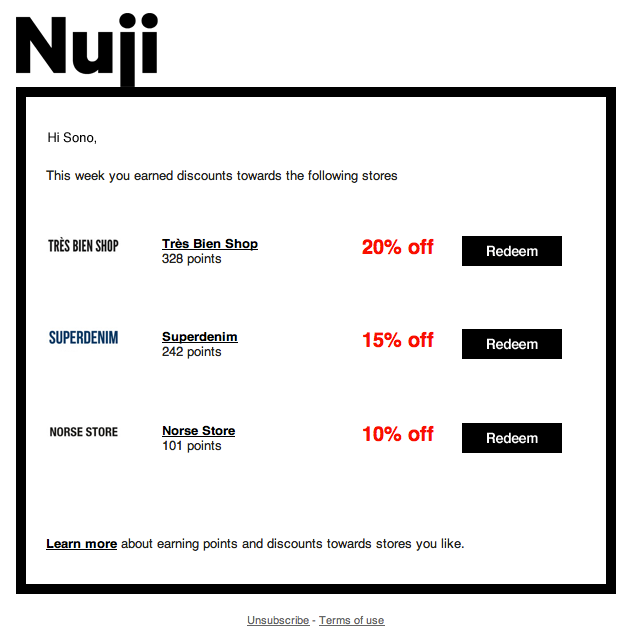 Nuji says that it has seen 730% growth in clicks to retailers and 167% growth in sales as a result of the rewards programme. “We’ve had 50 retailers commit to the loyalty mechanic with 60 on the waiting list. We are getting emails daily from stores wanting to join,” says CEO Dean Fankhauser. There are no household names in the list of currently participating companies – these are stylish, boutique brands. Nuji has always targeted discerning customers over the mass market. Despite its rapid ascent, Pinterest has suffered concerns over copyright-controlled images and its use of affiliate links to earn referral cash from user-generated content. With its tighter focus on commerce and retail partnerships, Nuji should be able to avoid such problems. Nuji is currently invite-only, but we’ve got the key to get you in. If you’d like to give it a try, click the link below for access.